The federal government shutdown is now on day 35. I just learned it might delay my income tax refund, but the IRS will continue collecting taxes. Yes, if the shutdown continues it is probable that taxpayers in Iowa and across the country will have to wait if they expect a tax refund. The IRS is only partially operating, and issuing taxpayer refunds is just one of the services that may be delayed according to the Wall Street Journal. Many states rely on federal funding to support their programs, and as ITR has been pointing out since last fall, Iowa has definitely become one of Uncle Sam’s dependents. In 2017, the federal government sent an estimated $700 billion in aid to the 50 states. During that year, Iowa received $8.5 billion in support from the federal government, an amount that eclipsed our state’s general fund budget by approximately $1 billion! Much of the federal aid is used for Medicaid, education, and other worthy programs. In addition to federal appropriations, state and local governments receive numerous grants from Uncle Sam, too. This shutdown provides a dire warning not just about keeping Iowa’s fiscal house in order, but also about the need to develop contingency plans in case federal money is delayed, reduced, or outright eliminated. Itemize all federal funds coming into Iowa so lawmakers and taxpayers can clearly and easily see the programs that are the ultimate recipients of those funds. 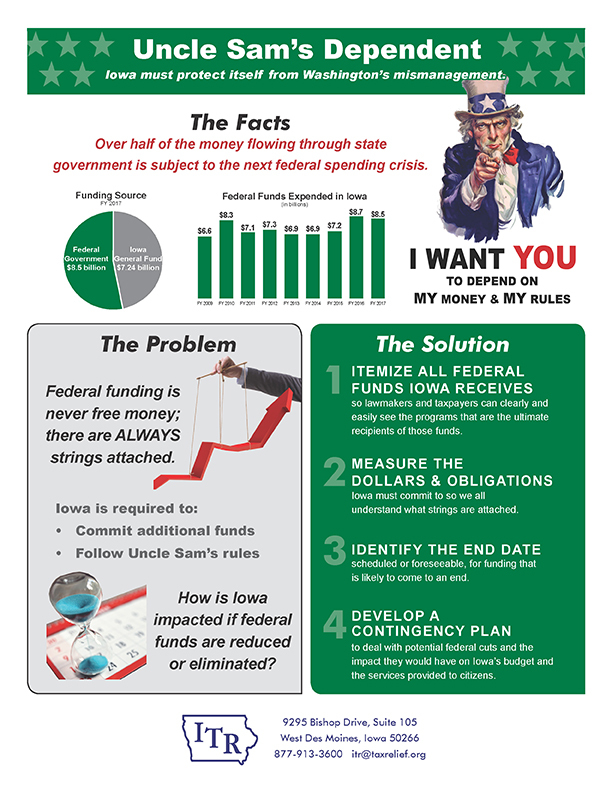 Measure the dollars and obligations Iowa must commit to so we all understand what strings are attached. Identify the end date, scheduled or foreseeable, for funding that is likely to come to an end. Develop a plan to deal with potential federal cuts and the impact they would have on Iowa’s budget and the services provided to citizens.